While women often played important roles in southern Jewish communities, no place were they more instrumental than in Blytheville, Arkansas. Jews had lived in this small Arkansas Delta town for several years with no formal efforts to found a congregation. In the 1910s, local Jewish women created a religious school to provide instruction to the area’s Jewish children. Classes were held in people’s homes. Later, they created the Ladies Aid Society to oversee these efforts and to “guide the religious, cultural, and social life” of Jews in and around Blytheville. Rosie Rosenthal was an early leader of the society. Their central goal was the creation of a Jewish congregation and synagogue. The Ladies Aid Society worked to raise money for the acquisition of a building. There weren’t enough Jews in Blytheville to support a synagogue, so they reached out to Jews in other towns in northeast Arkansas and southern Missouri. When Jews in Jonesboro, Arkansas asked them to affiliate with Jonesboro’s congregation, the society refused, and continued working to establish a Blytheville congregation. In 1924, local Jews worshipped together at a private home for high holidays services. In March of 1925, the Ladies Aid Society purchased a modest building on West Ash Street for $3000, which they named the “Jewish Community House.” This rectangular building was made of gray stucco, and seated 100 people. The Ladies Aid Society spent $900 refurbishing this new home of the area’s Jewish community. Appropriately, Blytheville Jews then formally organized a congregation in November of 1925. In 1928, the Ladies Aid Society officially deeded the building to the congregation’s board of trustees, all of whom were men. Although they ceded control to the community’s men, the members of the Ladies Aid Society were the cornerstone of Blytheville’s Jewish congregation. In 1940, the society changed its name to the Sisterhood of Temple Israel and joined the National Federation of Temple Sisterhoods. During the congregation’s years in the Jewish Community House, members Sam Orgel and Richard Jiedel led services while the congregation worked to raise money for a rabbi and a permanent synagogue. In 1936, they were able to hire their first rabbi, Maurice Lyons, who had just been ordained by Hebrew Union College. That same year, they officially adopted the name “Temple Israel” and received a sefer Torah donated by members Ike Rosenthal and S.S. Sternberg. In 1937, they added on to their building. Rabbi Lyons only stayed for a year; he was replaced by Rabbi Herman Pollack, who served for four years. Pollack was succeeded by Pizer Jacobs and Jerome Rosen. Clearly, Temple Israel was a “stepping stone” pulpit for these rabbis, as the congregation remained rather small. In 1936, they had 69 member families and 19 children in their religious school. 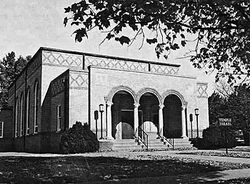 Though located in Blytheville, Temple Israel was always a regional congregation. Only 40% of member families lived in Blytheville; the rest were scattered among small towns in northeast Arkansas and southern Missouri. Some came from towns as far as 43 miles away. Perhaps because of the dispersed nature of the membership, and the fact that many members had to work on Saturdays, the Reform congregation held weekly services on Sunday at 3 pm right after the conclusion of Sunday school. The service was in English with some Hebrew prayers. Although Temple Israel was always Reform, in its early years, the members were more observant, using kippot and talit during prayer. Many of its members were Eastern European and came from traditional backgrounds, but found Reform Judaism to be more amenable to life in the Arkansas Delta. Though their numbers remained small, Temple Israel supported a wide array of Jewish charities, making contributions to the United Jewish Appeal, the Leo Levi Hospital in Hot Springs, the Jewish Hospital in Denver, the Jewish Children’s Home in New Orleans, as well as a number of local non-Jewish charities. Unsatisfied with the Jewish Community House, Temple Israel sought to build a more fitting home. They sold the house in 1942 and bought land at the corner of Chickasawba and 15th streets for the construction of a new synagogue. Wartime rationing and a decline in dues during the war delayed the construction. Ground was finally broken on July 10, 1946. The small gothic-style brick temple had eight stained glass windows and could seat 150 people in the sanctuary. It also had Sunday school rooms, a social hall, kitchen, and rabbi’s study. The building was formally dedicated in 1947. Helping in the push for a new synagogue was Rabbi Alfred Vise, who came to Temple Israel in 1945 after they had been without rabbinic leadership for two years. Rabbi Vise was quite popular and was very active at the Blytheville Air Force base, serving the spiritual needs of Jewish airmen stationed there. In 1951, the congregation gave him a parsonage, which later became an education building once they no longer had a full-time rabbi. 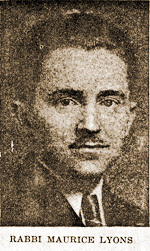 Vise served the congregation until his death in 1957. 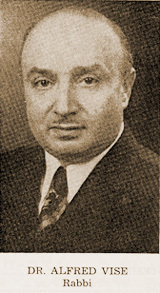 Rabbi Vise was the last full-time rabbi to serve the congregation as the Jewish community in the area began to decline in the 1950s. Farm mechanization and changes in the cotton economy led to economic hardships for many local Jewish merchants. In 1955, Temple Israel was down to 27 member families. After Vise’s tenure, Temple Israel had a series of student rabbis from Hebrew Union College. Perry Cooperman served as the longtime lay leader when a rabbi was not available. Huddy Cohen organized a youth choir and served as organist during worship services. She also led the religious school for many years. In 1972, there were 26 children in the Sunday school. The congregation continued to serve Jews across the region. In 1947, Temple Israel had members in seven different towns in Arkansas, and seven more in Missouri. Over time, as the number of Jewish families declined in Blytheville, most of Temple Israel’s members came from other towns. In 1990, only three Jewish families remained in Blytheville. Many members had moved to nearby Memphis. By 1993, the congregation, having experienced a further decline in membership, began to discuss closing. In November, 2003, Temple Israel held its last service, and put its building up for sale. Many of the synagogue’s artifacts went to Congregation Beth Sholom in Memphis, which used the Blytheville temple’s stained glass windows in their new chapel. The Torahs went to congregations in Memphis, Kansas City, and Columbia, Missouri. Temple Israel has followed the pattern of so many other small congregations in the Mississippi River Delta. While the story of its decline is not unique, the leading role of Blytheville women in creating the congregation makes the story of Temple Israel especially noteworthy.